Most people land in Sicily at Falcone Borsellino Airport, Punta Raisi, about 35km west of Palermo, the capital of the island, as we did as well. We stayed one night in Palermo and then headed to Taormina via Cefalu. I liked Palermo, a lot, and I regretted we did not stay more than one night but we had the hotels formerly reserved and had to move on, which was such a pity. Palermo is a chaotic city in terms of traffic. It is better to go by taxi from the airport to the hotel and then rent the car from the day you leave Palermo. GRAND HOTEL ET DES PALMES Via Roma 398 Highly recommended, four star old, historic hotel. Very well located, comfortable, large rooms. Good beds, good bathroom and excellent breakfast. CENTRALE PALACE HOTEL Via Vittorio Emanuele 327 Very good option, in the heart of the historical center. In Sicily you can enjoy the art of good cooking, food is serious matter and it shows. Fried street food is the Palermo specialty. Spinnato Antico Caffè Via Principe di Belmonte, 111. Very good ice cream and better espresso and cappuccino for breakfast. Osteria dei Vespri Piazza Croce dei Vespri, 6. Michelin starred restaurant in the heart of Palermo. Trattoria Biondo via Carducci 15 Regional italian trattoria, traditional dishes which have kept the Arab influence. La Cambusa Piazza Marina 16, Kalsa. The Trattoria is located in Piazza Marina, one of the city’s historical piazzas. We had a great fresh fish and seafood for lunch at the terrace on a nice day of June. Some people may tell you that there is nothing to see in Palermo. I disagree. Palermo is fascinating to me because of its history and people. The history of Palermo dates back to the Prehistoric Age and in 734 BC the Phoenicians established a merchant colony in the area. After this many different civilizations dominated the city until the Unification of Italy. shopping streets are Principe de Belmonte (pedestrian) via Libertà, via Roma and via Maqueda. Shoe and apparel stores are in Via Ruggero Settimo. These are my recommendations for those who cannot spend more than two days in Palermo. The Norman Palace and the Palatine Chapel Piazza Indipendenza, 1. Both buildings were the Royal Palace and the Royal Chapel of the Norman Kings. IL CAPO The best outdoor food market in Palermo. It is an active every day market, making it possible to buy both food as well as other merchandise. It stretches along the via Carini and Beati Paoli, via di San’t Agostino and via Cappuccinelle. Nicer and more picturesque than the Vucciria Market. 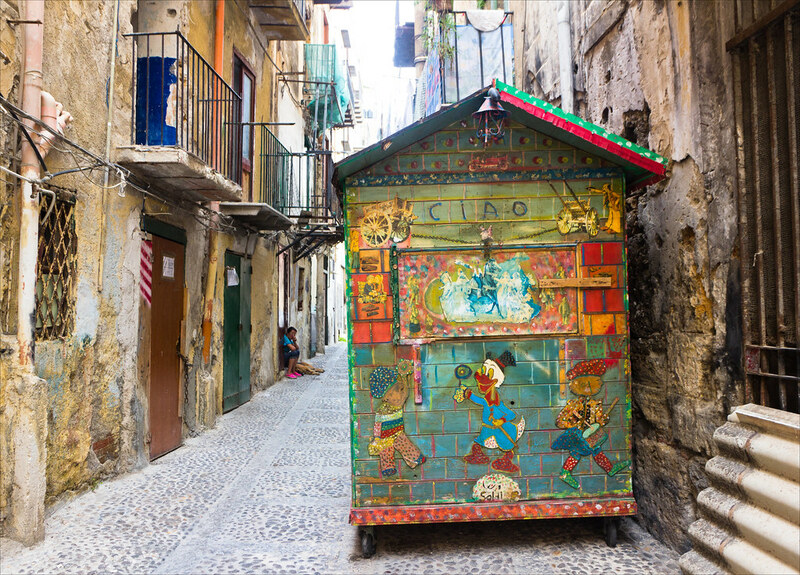 The puppet theatre emerged in Sicily at the beginning of the nineteenth century achieving great success among the island’s working classes. The puppeteers told stories centered on knights and princesses based on medieval chivalric literature, Italian poems of the Renaissance, the lives of saints and tales of bandits. TEATRO MASSIMO Piazza Verdi. Is the largest theatre in Italy and the third largest in Europe. Take a look at the ticket offices outside the theater, each is a work of art. The best opera, ballet and other cultural activities take place at this venue. LA KALSA The Arabs conquered Sicily in the ninth century AD leaving an indelible mark of their settlement. They entered Palermo through the Greeks Gate and founded the Kalsa. Love your pictures and whole experience ❤ really need to get there!